Friends, this evening I witnessed something truly inspiring, and I wanted to share it with you. A family of four came into the store where I work part-time and purchased nearly a thousand dollars’ worth of toys to donate to the less fortunate. And if that isn’t a true blue miracle, I don’t know what one is. On November 21, 1990–twenty-seven years ago today, and six months after Jim Henson’s death–the tribute special “The Muppets Celebrate Jim Henson” aired on CBS. 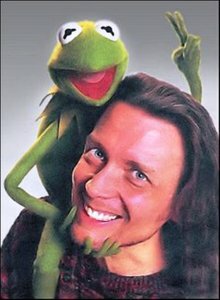 It was Steve Whitmire’s first performance as Kermit the Frog. He had had less than six months to prepare. Puppetry-wise, Steve was spot-on from the very beginning, giving Kermit these beautiful, subtle facial expressions. You can feel Kermit’s emotions as you watch; the sorrow and pride, the quiet joy and gratitude. Oh, what a difference eight years makes! But Ryan got it exactly right in 2009, and good on him for it. I don’t know if he still stands by what he said back then. Nevertheless, everything that he said back then is as relevant and true now as it was when he originally wrote it eight years ago. Also of interest is that our old frenemesis “Anonymous” makes an appearance in the comments section, up to his old tricks (although back then they might have been new tricks) of trashing Steve relentlessly, without regard for either facts or feelings. How far back in time does this ridiculous grudge go anyway? Dude, get a life! The year was 1978. A 19-year old, scraggly-haired, tall, lanky puppeteer approached a bin of puppets. These weren’t just any puppets, mind you, these were the Muppets. This young man had his wish granted by truly the greatest genie of all time, Jim Henson. A man who, to this young puppeteer, was on the same plane as John Lennon is to a musician, Albert Einstein is to a physicist, or Thomas Edison to light-bulb enthusiasts. This young man picked up a puppet, came up with a voice, and was immediately a featured player on The Muppet Show. The most widely aired show ever. This young puppeteer was named Steve Whitmire, and this is his Saturday. Watch your back, Mark. Star Wars is a Disney property now, and at Disney, nothing is sacred, everyone is expendable, and expressing opinions about a character you’ve played and/or been associated with for decades is considered “unacceptable business conduct.” If Kermit the flippin’ Frog is fair game, so is Luke Skywalker.